This is not a joke people I am really going to tell you what to do if you find an injured or seemingly lost, bat. 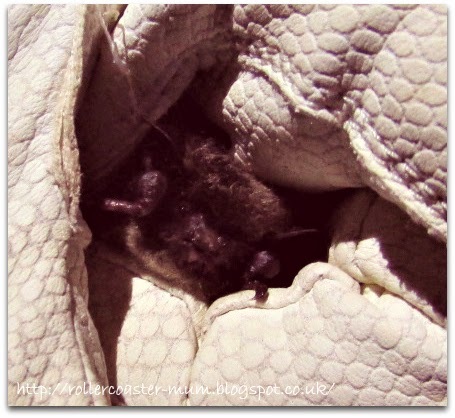 For the second time recently I am revisiting one of the first few posts that I wrote - in this case when we found a bat in our bedroom. The baby Pipistrelle Bat that we found in our bedroom. That was back in 2011 but about two weeks ago I was walking up the back lane near our house and spotted what I initially thought was a dead mouse on the ground but then I realised it was a bat and it was still alive. Now, having had a bit of experience in these things the first thing I did was to go and get a pair of gardening gloves before picking it up. Bats can bite (although most won't) and really you should not handle a bat unless you have to, as you are supposed to have a special license to handle them but needs must in some cases.There is also a very small risk of a rabies like virus if they do bite you, so do find those gloves. Initially I put it on a low wall as it looked pretty ill and I didn't think it would move much but I didn't want it to get run over by a car. The next, and most important thing to do is to call the Bat Helpline - 0845 1300 228. This is run by the Bat Conservation Trust and during the summer they also operate evenings and weekends. The helpline is run by volunteers though so please be patient with them. I duly rang the helpline which was answered by a very helpful lady who advised me what to do next. It was early evening on a Saturday so she was a volunteer and there was only so much they could do at that point. I had to find a shoe box, an old tea towel and a plastic milk bottle top. After making some holes in the top of the shoe box with a pencil I went out to get the bat only to find it had disappeared! Initially I thought a cat might have got it but after a bit of searching I found it on the ground a few feet away. It was obviously not as poorly as I had originally thought and had jumped off the wall. There was definitely something wrong though as it was unable to fly. It wasn't that keen on getting caught this time and hissed and squeaked at me but I managed to get it in the shoe box with a tea towel and a milk bottle top with some water in. The lady on the Bat Helpline had given me some numbers of local bat carers to call so once the bat was secure in his shoe box and put in the summer house I called a couple of them. One gentleman was the same man who had come out last time (from now on known as Batman!) and although they couldn't come out that evening he remembered where we were and said he would come to collect the bat the next day. This was further complicated in that we were off to Chessington the next day but we left the bat in the summer house in the garden so that Batman could get him. Two days later when we returned from Chessington the bat had been collected and Batman had left a bat leaflet for us. That evening he called us to let us know that our bat was a Whiskered Bat and therefore a rarer find than our last bat which had been a Pipistrelle. He said he was doing well and had no obvious injuries and was eating and drinking but that these bats could be tricky to look after. If the bat did survive then he would let us know and would come back to release it one evening. I told the girls he was doing OK but didn't want to get their hopes up. About ten days later, having pretty much given up hope, Batman called and said that Batty was fine, had been flying in his spare room(!) and was ready to be released. The date was set for Friday night so that the girls could stay up and watch and at about 9.30pm Batman duly arrived with Batty in a special little box. We had to wait for a little bit for it to get nearly dark and Batman explained that this was the first time he had successfully nursed a Whiskered Bat back to health so we were really lucky. He had been 4g when he had collected him and had now gone up to a whole 5g - a healthy weight for a bat - with the help of lots of mealworms. By about 9.45 is was dark enough and we all crossed the road to the edge of the woods, the girls in their PJ's. Batty was retrieved from the box and we had a chance to see his little face before Batman opened his hand and within seconds off he flew. After a couple of turns around our heads he was off into the woods and our good deed had been done. Batman had brought his bat detector (echo locator) so we could hear the calls and within minutes he had disappeared out of range - off hunting for insects we hope. Batty the Whiskered Bat about to be released back into the wild. Contain the bat in the shoebox (first put on the gloves) and then try to get the bat in the shoebox by either lifting it with the teatowel carefully or putting the box over it and sliding a piece of card underneath. Put the teatowel in the box to give the bat somewhere to hide and put a little water in the milk bottle lid for it to drink. Shut the lid firmly. We had to put masking tape round the edge as it wasn't a very tight fit and the bat escaped once! Put the bat somewhere safe, dark and quiet if possible, and not too cold. 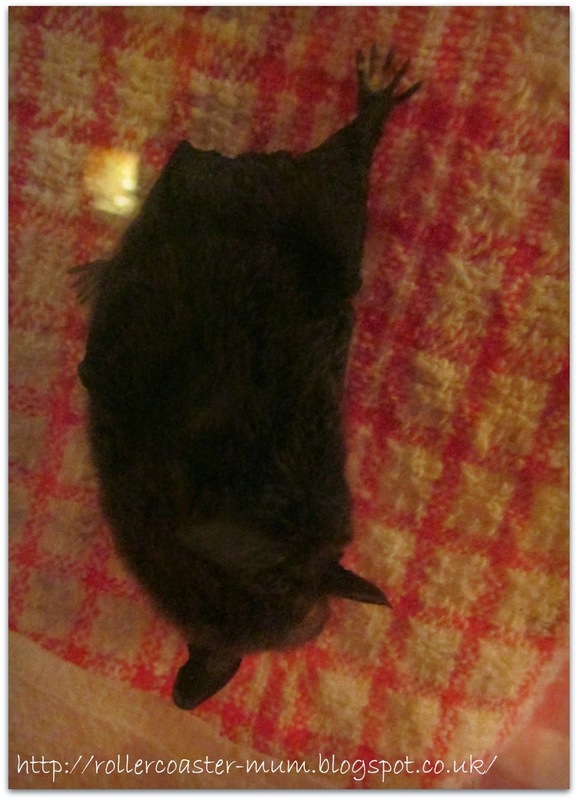 We used the summerhouse as it wasn't cold and the bat was then safe from kids and cats! Make sure you have called that Bat Helpline and they should get a local bat carer to contact you and hopefully like our brilliant Batman they will come to collect your bat and nurse them back to health. You should never release the bat yourself as they need to be checked over by a proper Bat Carer to make sure they are healthy. The Bat Conservation Trust do a brilliant job and if you do find one of these amazing little creatures please contact them, or if you fancy volunteering, donating or helping give them a call. They can also be found on facebook and twitter. PS - I have not been compensated in any way for this post I just want to help the bats! How cool is that to be able to help an injured creature and have it released back into it's natural habitat - thanks for the tips - we get a lot of bats around here although fortunately so far I haven't come across any injured ones. Really informative, have to admit to being rather squeamish round any animals!! We often see bats flying around at dusk. A friend of ours has rescued a couple of young ones and had them collected by ' The Bat People ' and then received letters informing them that they had been re-released. Thanks for lining up and sharing your information with Country Kids. Wow, I had no idea that the bat helpline even exists. Thank you for an eye opener. 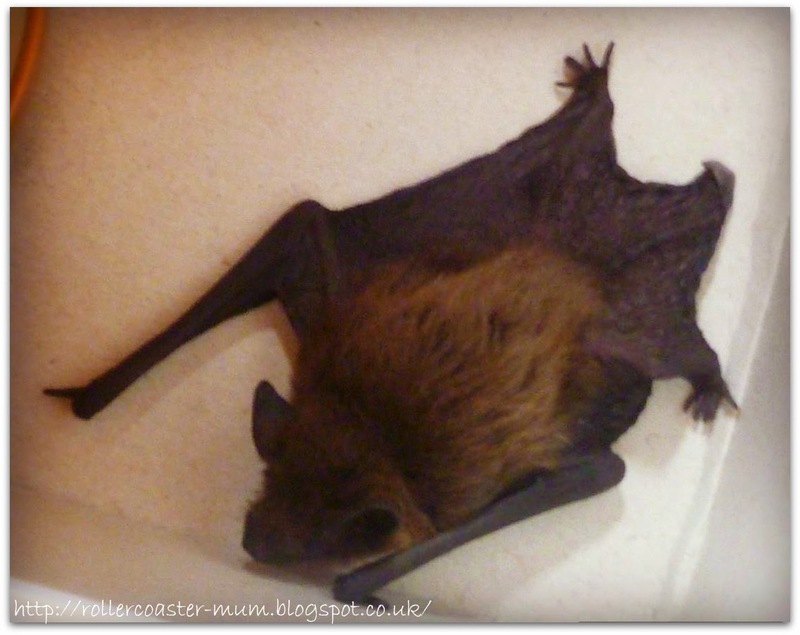 What a lovely blog, I'm one of the Bat Helpline volunteers and its great to get hear the whole story like this. We went on a bat hunt a couple of year ago with the local wildlife trust to find lesser Pipistrelle bats.I had forgotten about that they spread rabies though.I'm glad Batty made it back to the wild. My daughter had the same experience recently here in Cornwall (a long eared bat in the house, hanging on a coat hanger!). It was collected next day by the local Batlady, and returned a few days later, to be released back into the woods that surround the house. The video of the release was awesome. I think of bats as "mouse angels" ! By the way - bats in the UK do NOT carry rabies!!!! Well done on rescuing the bat and also knowing what to do! I don't think we get bats near us but my dd loves them so I have promised her we'll do a guided bat walk at a local woodland or NT property soon!